Parent Teacher Conferences do not need to be a stressful time! With some planning and preparation, you can handle them like a pro and work together with parents to help your students find their ways to success. 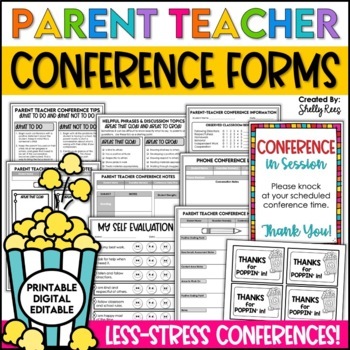 These EDITABLE parent teacher conference forms and conference guide take the stress out of conference time! If you are looking for a Professional Development video on this topic, check out my Effective Parent Conferencing P.D. Video HERE! It includes this Parent Conference Forms Packet. Click HERE to SAVE 25% by buying this resource as part of my Back to School Super Bundle! 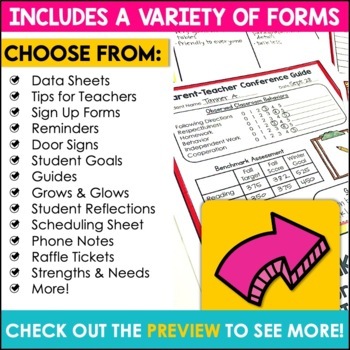 This packet now includes an EDITABLE packet of conference forms so you can easily type in your students' names, information, data, and notes for conferences! The titles and words on the forms are NOT editable. 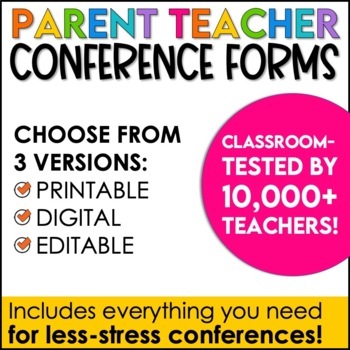 This packet will definitely help you to prepare for and lead effective, meaningful, worry-free parent teacher conferences! "Perfect and useful! I felt very prepared for conferences!" "Very well organized and helpful reminders to create smooth conferences!!!" 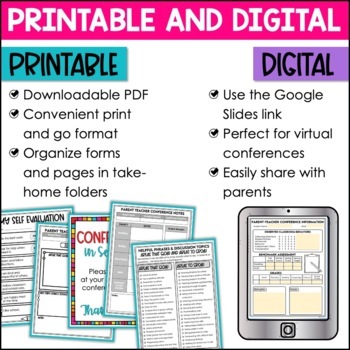 "These conference forms use parent language and are easy to use even in the primary grades! I love the sweet notes for the students too! This was great for my parents who were waiting outside for their conference. I can't wait to see my kids' reactions when they come in to find their love notes!" "This packet helps to ease the tensions that often go hand-in-hand with preparing for teacher conferences. Thank you!" "These made PT conferences easy! You did all the work, so I don't have to stress! THANK YOU!" "As a first year teacher this is amazing! This covers everything needed and has really helped me prepare!"